In 1921, the upward-lifting garage door was invented by C.G Jhonson; he was also the man behind the invention of the electric garage door opener in 1926. A garage door consists of more than one panel hinged together which a system of tracks which the help of roller. Torsion spring system or garage door springs play a vital role in balancing the weight of the door. 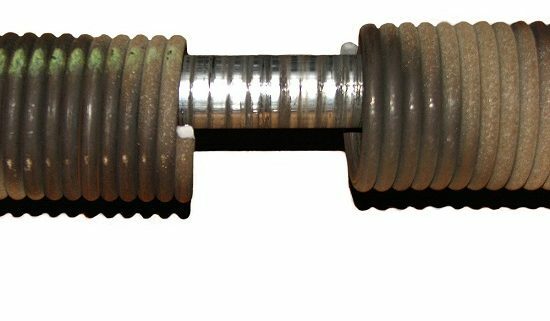 A garage door spring or torsion spring system which counterbalance the weight usually consist of one or maximum two very tightly wound up springs on an iron shaft with cable drums at both of its ends. The entire system placed on the garage wall above the garage door and has no less than three supports. A center bearing plate with an iron or nylon bearings and two end bearing plates one at each end. The garage door springs are consists of the steel wire with a non-moving cone at one of its end and a cone which can wind at the other end. The non-movable cone is attached to the central bearing plate. The cone which can wind is consists of the hole at a distance of every 90 degrees for the winding of the springs and two sets of screws to make sure the springs to the shaft. 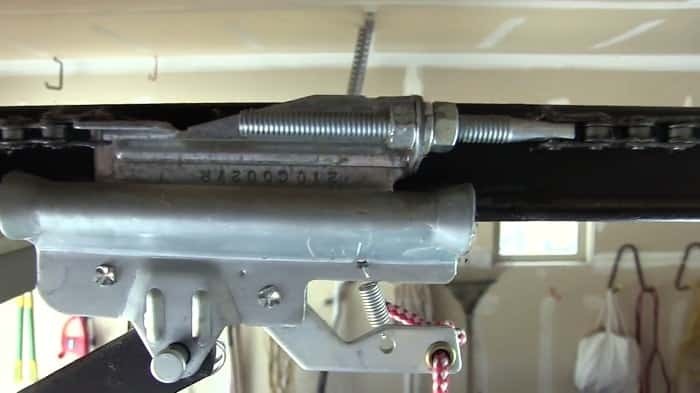 The counterbalance cable which is made up of steel run from the roller brackets which is placed at the bottom of the corners of the door to a notch which is at the cable drums. The springs unwind when someone raises the door. When the door comes down, the cable unwinds from the drums, and the springs rebound to regain its previous position of full tension. The springs fitted by the door manufacturers, door dealers produce and sell torsion spring which comes equipped with garage doors support a minimum of 10,000 to 15000 cycles. One cycle means a complete round of opening and closing of the garage door. With a lifespan of 10,000 to 15,000 cycles, the springs allow the garage owner to close or open his or her garage from 3 to 7 years. If the owner puts some extra weight on the door by painting several times of fitting glass, then that could reduce the lifespan of a torsion spring. It is the responsibility of the owner of the garage to check the door of the garage monthly. If someone faces any obstacle at the time of raising or lowering the garage door or the door doesn’t remain stationary at the highest point, then he or she should conclude that the balance of the door has been disturbed and should be checked. Then he should ask an expert mechanic to rebalance the springs of the door or replace it if needed. Along with that, one should never forget to lubricate the garage door springs regularly for the frictionless movement. Garage door torsion springs as the name suggests finds utility in the overhead garage doors. In a garage door, the torsion springs play the role to balance the weight of the garage door. The first time C. G Johnson made an upward-lifting garage door in 1921 and again went ahead to invent electric garage door openers in 1926. There are several kinds of garage doors now available in the market. Single panel garage doors, which is constructed from a single monolithic panel. Single panel garage door has a disadvantage. When the door is opened, the panels of the door swing upward in an arc and get deposited at the top of the door and bulges outside of the door. That means the vehicle has to stop in front of the door at a distance. Otherwise, there is a chance of getting damaged by the arc formed by an upward going door. In the case of sectional doors, there are six to eight numbers of panels instead of one in the single-panel door. Sectional garage doors have some advantages over the single panel garage door. It has more strength in comparison to single panel doors, and a vehicle can park close to the door at the time of entering into the garage as there is no danger of being get damaged by the garage door. Roller doors are usually made up of corrugated steel, though other materials can be used for its manufacturing. These kinds of doors especially find a place for the commercial use, but there is also a disadvantage here, these types of doors cannot be insulated entirely. No matter what kind of door one is using for his or her garage but there are garage door torsion springs are found in every type of garage doors. And it is the torsion spring which is responsible for the upward and downward movement of the garage door. And door torsion spring is the only part which requires constant maintenance. Usually, the torsion springs come with the garage doors have a standard lifespan of 10,000 to 15,000 cycles, where a cycle means closing and opening of the door once. So, with a lifespan of 10,000 to 15,000 cycles, torsion springs can help the garage door to function smoothly for almost 3-7 years. After that these may need replacement. If someone isn’t able to open his or her garage door easily as he or she should or the door doesn’t stay stationary at its upper position then he or she should go to an expert mechanic and ask him to check the garage door springs. If those are in good condition, then he would rebalance those or he will ask to replace those. Then the owner should act according to the mechanic for the shake of his or her garage door and the shake of his or her vehicle. If one able to keep the torsion springs of his or her garage door well, then his or her garage door will remain well. Every people have a vehicle need a garage to keep his or her vehicle, after all, who doesn’t want the safety of his loved vehicle? If one needs a garage to keep his or her vehicle, then the garage itself needs a door to keep itself closed. But before 1921, when C.G. Johnson invented the garage door, there was no special mechanism for keeping the garage closed; in 1926 the same inventor went further to invent electric garage door, so the owner has to make no physical effort to open or close the door of his or her garage. Garage door extension springs is a much-needed component of the garage door invented by C. G. Johnson, which balances the weight of an upward-lifting garage door invented by the genius when the door is in an open position. Now there are several kinds of garage doors available in the market which differs from one to other by their design. A single panel garage door is made up of a single panel which goes up at the time of opening of the garage door. But there is a serious lacuna present in these kinds of garage doors. At the time of opening of the door the panel is deposited at the upper part of the door and bulges outside, so if the vehicle which is waiting to go inside the garage can be damaged by the door it that is standing close to the door. Another kind of garage door which is available in the market is a sectional garage door which usually consists of 6-8 panels unlike to single panel doors where only a single panel is used. More panels ensure more robustness of the sectional panel garage doors. The other kind of garage doors available in the market is roller doors which are made up of corrugated steel which means their doors are shockproof. But there is a problem in these kinds of doors as these cannot be perfectly insulated. But no matter which is your garage door, garage door extension springs from the most vital part of it. Another kind of garage door which is available in the market is a sectional garage door which usually consists of 6-8 panels unlike to single panel doors where only a single panel is used. More panels ensure more robustness of the sectional panel garage doors. The other kind of garage doors available in the market is roller doors which are made up of corrugated steel which means their doors are shockproof. But there is a problem in these kinds of doors as these cannot be perfectly insulated. But no matter which is your garage door, garage door extension springs from the most vital part of it. Garage door springs are responsible for the upward and downward motion of the garage door, and the extension springs also hold the weight of the door at the time when the door is in open position. So, if anyone gets difficulties when opening or closing of his or her garage door when he or she should take immediate action to call an expert Garage Door mechanic to check the health of the extension springs of his or her garage doors. If the mechanic finds the torsion spring is in good shape, then he will rebalance those or asks the owner to replace them. And the owner should follow the words of mechanic to keep the door of his or her garage healthy. But the owner has to do another bit of thing by lubricating the springs of his or her garage doors regularly to ensure perfect movement of the door and to enhance the lifespan of the springs. Every person needs a home to get a rescue from sun, rain and cold as a prime need. Same holds true in the case of a vehicle. A vehicle also needs an abode to protect itself from sun, rain, and cold. But before 1921, there was no mechanism to build a door for the abode of the vehicle, which is called as a garage. But in that same year of 1921, a research fellow named C. J. Thompson managed to build a door for the garage after that every garage of all over the world got the way to be closed. The garage door consists of many parts like steel panel, torsion springs, and steel cone. But the torsion springs are the main component of a garage door, which is responsible for the upward and downward movement of the door; so needs to be replaced after a certain period. This article is making an attempt to guide you how one can do garage door springs installation. To install the garage door springs, one has to first of all lock the garage door at the down position. He or she can do it by locking or locking pillars just above the lower roller in the track. The aim is to prevent the garage door from rising. Thereafter he should disconnect the garage door opener from the door of the garage with the help of a safety rope, one could completely unplug it. One should take some safety measures before doing this as the torsion springs are extremely tensed when the garage door is in down position. One should wear safety glasses and should make sure that the ladder is stable. After taking the safety measures, one should go ahead doing garage door springs installation, by placing the ladder under the winding cone of the unbroken spring. The cones which can wind are pointing away from the center of the door. Stationary cones are usually mounted to a bracket with two bolts. After doing the above one should place the winding bar in the winding cone hole. After that, one should slowly unscrew the two sets of screws of winding cone. Then with both winding bars, one should slowly unwind the torsion spring with intervals. If one found the torsion tube badly dinged up, then he or she should consider replacing the tube also. Then remove the two bolts which run through the torsion springs near the center of the door. Ensure that all sets of screws are loose on your springs; one should move the ladder to the red cable drum. After doing this, one should go on to red cable screws and black cable screws. After removing the old torsion springs from the door, one should install the new one in the similar process as he or she uninstalls the old one. Hoping that this article which is to guide one to garage door springs installation will help you as well.